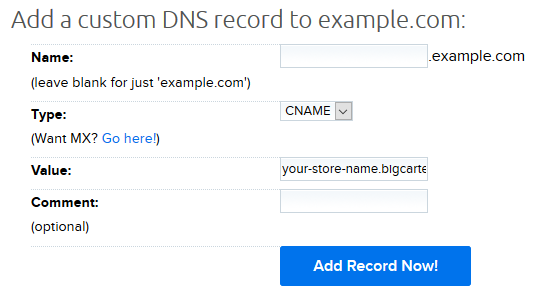 If your domain is registered at DreamHost, you can point your DNS to BigCartel. The screenshot below uses the domain example.com. Your domain appears instead when following these instructions. Set your domain up in your panel to DNS Only. Enter the Name, Type, Value, and Comment (optional), and then click the blue Add Record Now! button. Your site is now pointed to BigCartel. However, only the 'www' version of your site is pointed. The next section explains how to create a redirect to the 'www' version of your site so it always functions. View the Redirect Domain articles for detailed instructions on how to create a redirect. Your site now always redirects to its 'www' version which then redirects to BigCartel.